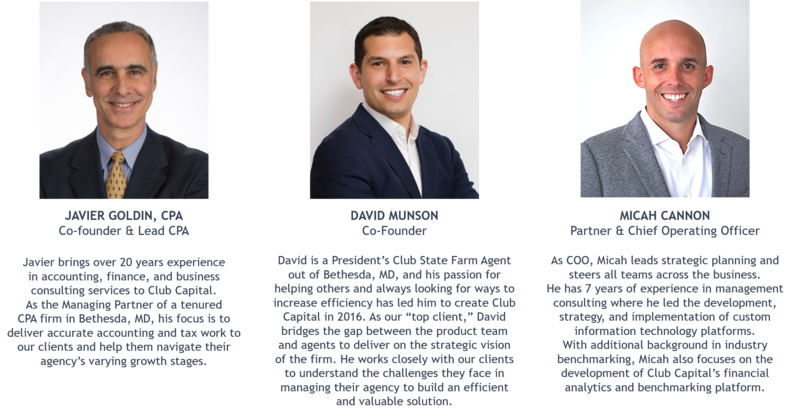 The idea behind Club Capital came from the pain points of one our Partners, David Munson, during the first few years of owning his insurance agency. Having studied business during college, he had a sound (and aggressive) business plan that had impressed the parent company and that he was hell bent to achieve. As a sole-owner entrepreneur, David found that scaling his business was much harder than initially planned. One of the most crucial elements to scaling your business and making pivotal, strategic decisions along the way is the ability to maintain accurate business financials and understand your cash flow. This was the area of his agency that he simply did not have a handle on. As David took a step back to evaluate how he could get the financial and business data he needed to make strategic decisions, he realized the way in which he was running his “back office” was what was limiting his growth. Thus, Club Capital was born. David initially had his primary back-office functions silo’d between a payroll software company, a local bookkeeper (that didn’t know his industry), and a CPA. All three functions of the back office were in three different places, and he was the go-between when one of them needed to talk to the other. He was doing the work and simply delivering it to his CPA at the end of the year. Any reports he did receive for his business were once or twice per year, on paper, and had no comparisons to the industry or his peers. Not efficient. Not valuable. Tapping into his personal and professional network, he created a leadership team that bolstered his industry experience with finance and consulting expertise to build a solution that would not only work for him but for agents around the country. Club Capital has been designed from the ground up to be much more than your run-of-the-mill CPA firm. We certainly handle our clients personal and business taxes, but we emphasize the need for monthly financials, peer comparison, payroll, HR, and benefits support all managed by a single team. Not just a singular service, but a strategic advantage to help your business grow.